Welcome to the peaceful world of Sylvania. Sylvanian Families is waiting for your child to take them home and play with them in their own little world. Sylvanian Families toys help teach children family life with houses, furniture, towns, schools and other traditional family scenes. 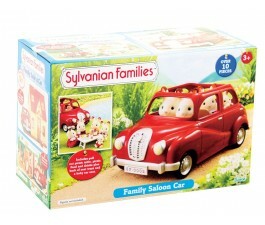 Our extensive selection of Sylvanian Families toys affords you many different families and accessories for your child. 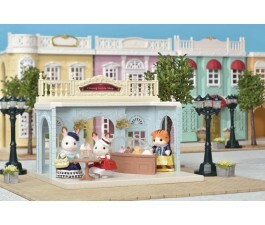 You can buy your child's first Sylvanian Families playset online. As they get more Sylvanian Families sets, they can build an entire neighbourhood. We carry many different playsets, Sylvanian Families play vehicles and other accessories to complete their Sylvanian world. Sylvanian Families originated as a line of collectible animal figurines. The figures released under this brand are anthropomorphic forest creatures. Sylvanian Families was created in 1985 in Japan. It belongs to the Japanese gaming company called, Epoch. In their nearly 30 years of manufacturing figurines, Epoch has expanded production from exclusively figurines to housing sets, automotives, and location accessories. The Sylvanian series has been the inspiration for several television creations spanning the globe. All of the Sylvanian products promote wholesome family values. The extension sets for the figurine toys make it possible to create large family houses, restaurants, and even hospitals. The Families franchise makes it easy to create a whole town by making products that all add on to what you already own. The newest toys from this Japanese company are the family cars, the Beechwood Hall starter kit, and several furniture and accessory additions such as the vegetable garden kit. If you are new to the Sylvanian product line, don't worry! Sylvanian Families makes starting a new forest-town simple by advising first time buyers on what to purchase.The Sycamore Cottage is the latest recommended starter kit from this company. This kit includes a house, a figure, furniture, and various accessories. The more accessories you purchase thereafter can be used to stock the cottage house. After you're satisfied with the initial set, you can buy a larger family home extension kit for your figures. As you fill your larger home and become more engaged in the Sylvanian world, you can begin buying hospitals, restaurants, vacation and recreation sets. Recently, Sylvanian Families released a tree house play kit.